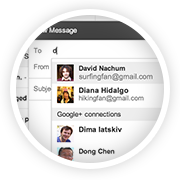 Ever wanted to email someone you know, but haven't yet exchanged email addresses? 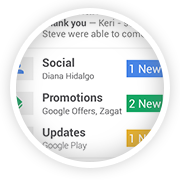 Starting this week, when you're composing a new email, Gmail will suggest your Google+ connections as recipients, even if you haven't exchanged email addresses yet. Emailing Google+ connections works a bit differently to protect the privacy of email addresses. Your email address isn't visible to your Google+ connections until you send them an email, and their email addresses are not visible to you until they respond. 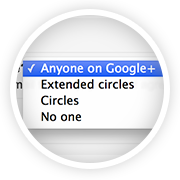 You're in control of whether people can reach you with a new setting in Gmail on the desktop. To learn more, check out the Help Center. You have received this mandatory email service announcement to update you about important changes to your Gmail product or account.